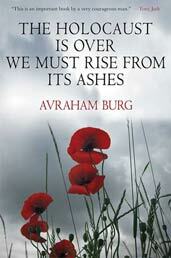 Review of Avraham Burg, The Holocaust Is Over. We Must Rise From Its Ashes. (New York: Palgrave Macmillan, 2008), 253 pp. Twenty years ago Avraham Burg was elected to Israel’s national parliament, the Knesset, and later became its speaker. He also took a leading position with the World Zionist Federation. His father was a long-time cabinet minister under Menachem Begin. So he belonged to the Israeli establishment. But more latterly, he has renounced his political career, being convinced that Israel’s leaders have been following a dangerous and self-defeating course. Israel has for too long been captivated by the memory of the Holocaust and should now adopt a new and more liberal political stance. This book, with the provocative title The Holocaust Is Over. We Must Rise From Its Ashes. is his contribution towards this change of heart he now desires. In Burg’s view, since more than seventy years have now passed since the catastrophic crimes of the Holocaust, Israel must now move on. He believes that the legacy of the Holocaust has been misinterpreted and manipulated. The officially-sponsored commemoration ceremonies and rituals have only served to allow Israelis to cling to the tragedies of the past, and so block the path to a more positive future. He deplores, for instance, the fact that present-day school children are escorted to Poland to visit the death camps, and are taught to believe that they are all Shoah survivors. The Holocaust, he asserts, has produced in Israel a climate of defensive aggressiveness. Israel has adopted the legacy of insecurity characteristic of trauma victims. The result is a hard-faced belligerence, not only against the Palestinians inside its borders, but against all outsiders. Israel today is a nuclear power, armed to the teeth, and has the backing of the world’s greatest power. Yet it believes it necessary to maintain a climate of hostility and isolation, upholding a militaristic society backed by all the latest weapons of mass destruction. Burg’s remedy is to move on, leave Auschwitz behind and learn to trust the world and humanity again. Israelis should take a wider view and universalize not nationalize the Holocaust. They should oppose human suffering in general rather than cling on to the one instance which most affected their predecessors seventy years ago. Instead of reproducing the mentality of an old, small East European Jewish town, forever persecuted, Israel should adopt the trail-blazing alternative forged by the early Zionists when they first arrived in the Middle East, redeeming the land through their hard labour and innovative social organisms. Of course this criticism and these suggestions, coming from a prominent Israeli politician and opinion maker, aroused fierce anger in Israel’s leading circles. He challenged the core of the national identity as developed over the past sixty years. Burg was dismissed as a romantic idealist, whose utopian solutions for world peace are wildly unrealistic. Yet Burg’s optimistic hope is that Israel could become what its founders wanted – preaching and practising peace in a war-torn and strife-filled Middle East. This in his view could be the true legacy of the Holocaust. In the wider perspective, Burg is surely right. Sooner or later the events of seventy years ago will begin to fade away. However much the memorialisation of the Holocaust is cultivated and expensively propagated amongst the Jewish population in Israel and abroad, there will come a time when the younger generation will look to other models for political guidance. The shock of the death camps, the gas chambers, the ghettos or the rampant brutality of Nazi thugs will all come to be seen as history, regrettable but over. This translation into English from the original Hebrew is clearly aimed at the younger generation of American Jews, whom Burg believes will be the ones to give a new kind of leadership to the beleaguered Jewish community of today. American Jews are called, he claims, to take up the great spirit of universalism, once expressed by their nineteenth-century leader, Rabbi Julian Morgenstern. This would be a far more positive contribution than the continual emphasis on Holocaust disasters, so graphically rehearsed in American-made films. Modern Israel’s identity, Burg holds, should be established on foundations of optimism, faith in humans and full trust in the family of nations. The era of fearful Judaism and paranoid Zionism is over. The faith of the Jewish people in the world and in humanity must be rehabilitated. But whether this passionate plea can outweigh the present Holocaust-dominated climate of fear and repression remains to be seen.